Gummy eyes are one of our most popular Halloween candies. Personally I am not crazy at the thought of biting in to an eyeball, but kids love them. Popping an eyeball in my mouth and chewing that gummy texture is not for me, but it is amazing how much fun the kids have with them. Not only are they great to hand out for trick or treat, but also fun to use when you are baking. 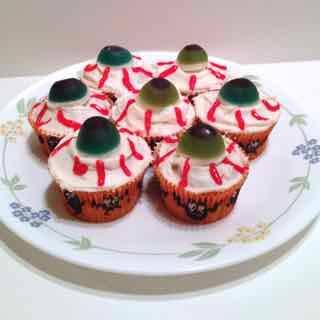 If you are looking for a sweet dessert that kids will love how about some cupcakes with gummy eyeballs. These are extremely easy to make and cupcakes don't take a lot of time. I was going for quick as I was told last minute that a treat was needed. So I just made up a bunch of cupcakes like normal. Popped a gummy eyeball in the middle and add some lines with the red gel to make them look blood shot. However there are so many ways to make this much more spooky with a little time and imagination. This were made for a high school party. I didn't have a lot of time to come up with something I thought would be special, but I was told they were a big hit and were gone pretty quick.